Rachel Linden spent her childhood in a magical world of make-believe, enjoying countless hours playing pioneer house under a towering blue spruce tree, mixing potions for enchantments, and pretending to be a member of the French Resistance in WWII. These early adventures prompted her to write stories with such exciting titles as Beans!, which she fashioned into books bound in cardboard from cereal boxes. Rachel’s taste for adventure and her interest in the world led her to a career as an international worker with a faith-based charity, and her experiences living and traveling in forty-seven countries around the globe continue to provide excellent grist for her stories. 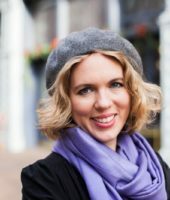 Rachel holds a BA in Literature from Huntington University, an MA in Intercultural Studies from Wheaton College, and studied creative writing at Oxford University in England during her undergraduate education. She currently splits her time between Seattle, Washington, and Budapest, Hungary, where she lives with her husband and son on the banks of the Danube River. When she is not dreaming up a new story, Rachel spends her time traveling on trains across Central Europe with her family, enjoying good food and wine with friends from around the world, and exploring the natural beauty of the Pacific Northwest and the history and architecture of Europe. Find out more about Rachel Linden here. Discover books by Rachel Linden.